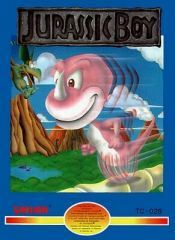 This is the [horrible] boxart fir Jurassic Boy. The logo is a ripoff of the 'Jurassic Park' logo, and Jurasic Boy himself looks horrible. This is the American-styled cart for the pirate game. It was later added to Multi-Carts released by Sachen. This is the Famicom cart for the pirate game, usually seen ith NES Ripoffs like the 'Gamestation', usually seen in Taiwan or Phuket.